Although Champion began producing jerseys for all NBA teams for the 1990-1991 season, they didn’t start producing replica jerseys for resale until 1991-1992 (most likely the summer of 1991, prior to the start of the season). Evidence of this can be seen in the Portland Trailblazers jersey design. 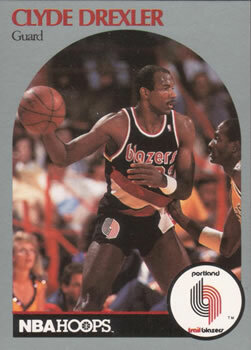 For the 1990-1991 season, the Trailblazers had the “lower case” Blazers logo. No Champion Trailblazers replica jerseys exist with the older “lower case” Blazers logo from the 1990-1991 season. Much of this was probably due to the limited platen size available on the heat presses that Champion was using in their production facilities. The platen is the heated upper plate on the heat press and most likely was 14″ x 14″, which means that printing outside of this size range wasn’t possible. Therefore, all designs would be limited to a 14×14 area on the jersey. Therefore, while the authentic Trailblazers jerseys had stripes that run across the entire front torso, the replica jerseys initially had stripes that were short and limited to the width of the “Blazers” logo. 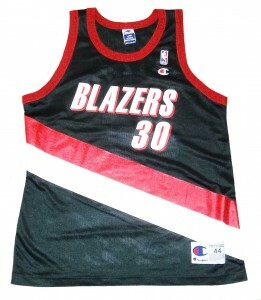 Champion would add the stripes to the Trailblazer replica jerseys for the 1992-1993 season. In addition to adding the stripes for the 1992-1993 season, Champion also changed the neckline from a multicolor white/red trim, to a solid red trim. They also released white home jerseys, although they were extremely limited in both player availability and quantities printed. It was common for Champion to mainly release road jerseys for most teams, while home jerseys were limited and harder to find. 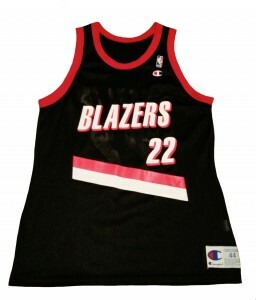 Champion wouldn’t change the Trailblazers jerseys until 1998-1999. It appears during this time that they finally were able to update their printing techniques and print across the entire front torso of jerseys (for instance, other teams like the Utah Jazz finally had logos that stretched across the entire chest). The stripes stretched across the entire torso, replicating what the players actually wore on the court. The only other change was the players names on the back of the jerseys went from straight orientation to a rounded/curved orientation. Also, Champion issued more white home jerseys in a wider variety of players, although quantities were still limited, and they are still scarcer than the black road versions. While most teams eventually transitioned to vests by the 2000-2001 season, the Trailblazers were one of the few teams that still had the traditional tank-top style jerseys when Champion ceased production of replica jerseys after the 2001-2002 season. ← Authentic vs Swingman vs Replica Jerseys…. Thanks for checking out the site. 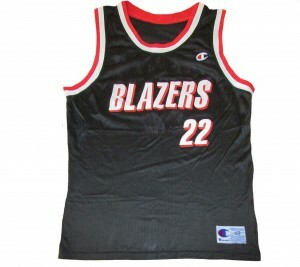 Champion stopped making jerseys after the 2001-2002 season. During the 2001-2002 season they were still producing replica jerseys for all teams, and authentics for 8 teams (Atlanta, Los Angeles Clippers, New Jersey, Orlando, Philadelphia, Phoenix, Utah and Vancouver). Starting in the 2002-2003 season and moving forward, Champion was completely out of the picture when it came to NBA jerseys. EXCEPT for in Europe, where they continued to produce replica jerseys until 2006 when Adidas signed there current deal with the NBA. And Champion European jerseys were always higher quality than the replicas in the USA. They had better production capability for these jerseys, using dye sublimation printing which gave them full coverage on the jerseys to include all the details such as pinstriping and full-width chest graphics. In addition, they used 100% polyester and not 100% Nylon like here in the states. The jerseys incorporated side panels in Europe, whereas in the USA the jerseys were just solid, one-color nylon construct. In the USA, the graphics were applied by heat transfer, so you have “rubbery” numbers/letters/logos. In Europe, because of the dye sublimation technique, the graphics feel like they are part of the fabric…they are not rubbery. In addition, European sizing was S, M, L, XL….whereas in the USA they used the chest size measurement on the jock tags 36, 40, 44, 48. So you can easily tell a European jersey just by the jock tag, but most times you can tell a European jersey by the more intricate detailing like pin stripes or side panels. Hope this helps!